St. Patrick’s Day provides the perfect opportunity to celebrate Irish culture. 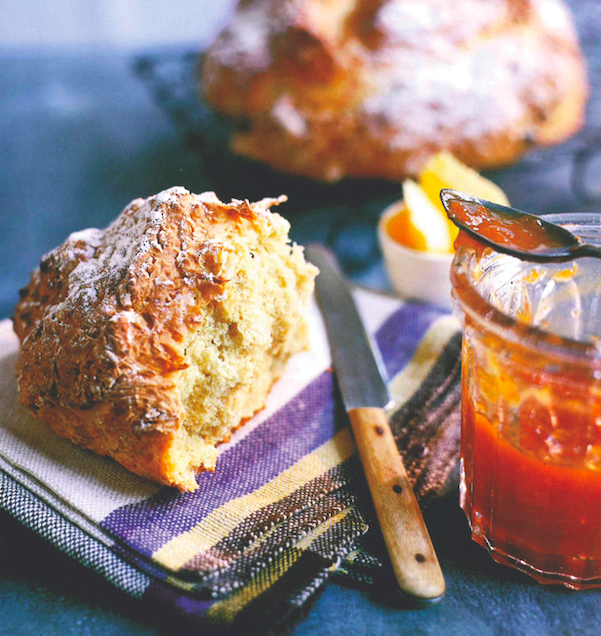 Such celebrations are not truly complete without some traditional Irish food, such as the following recipe for “Irish Soda Bread” courtesy of Linda Collister’s “Quick Breads” (Ryland, Peters & Small). Sift the flour, baking soda and salt into a large bowl and make a well in the center. Pour the buttermilk into the well and mix it into the dry ingredients with a round-bladed knife or your hands to make a soft, slightly sticky, rough-looking dough. Turn out the dough on a lightly floured work surface and shape it into a ball. Set the dough onto the baking sheet and gently flatten it so it is about 11/2 inches high. With a table knife, score the dough with a cross. Dust with a little flour then bake for about 35 minutes until a good golden brown. To test if the loaf is cooked, tap underneath with your knuckles. If it sounds hollow, it is ready. If it gives a dull thud, bake it for a few minutes longer and test it again. Transfer to a wire rack to cool. Wrap well to store or freeze for up to 1 month.